Steer clear of drug interactions with grapefruit by checking the list of additional medications that raise interaction risk. A juicy grapefruit is both refreshing and healthy, but if you’re taking certain prescription medications, think twice before digging into one. A new study in the Canadian Medical Association Journal reveals 43-plus drugs are risky when taken within 72 hours of eating grapefruit or drinking grapefruit juice—causing reactions ranging from fainting to sudden death. Previously, only 17 medications were flagged. The most commonly prescribed drugs that interact with grapefruit are cholesterol-lowering atorvastatin and simvastatin (Lipitor, Zocor); quetiapine (Seroquel) for bipolar disorder and nifedipine (Procardia) for angina. New additions include solifenacin and tamsulosin (VESIcare, Flomax) for urinary issues and eplerenone (Inspra) for hypertension. Normally, an enzyme in the small intestine regulates how much of the drug is absorbed. Grapefruit, however, contains a compound that inhibits the enzyme so more of the drug gets absorbed. 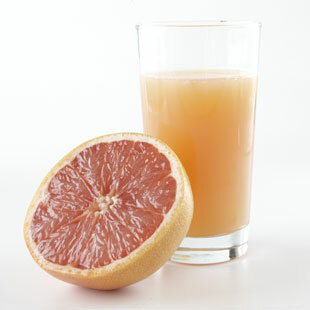 For a full list of medications that interact with grapefruit, click here. Always ask your physician and pharmacist about any possible interactions.